The craft beer trend has only just reached Thailand. So when my friend mentioned he’d like to take a trip on the Chao Praya River and visit somewhere relaxed and not too touristy, we excitedly ventured off to the artisanal island of Koh Kret to search for lovingly made handicrafts and (more importantly) lovingly made beer at one of Bangkok’s few micro-breweries, Chit Beer. 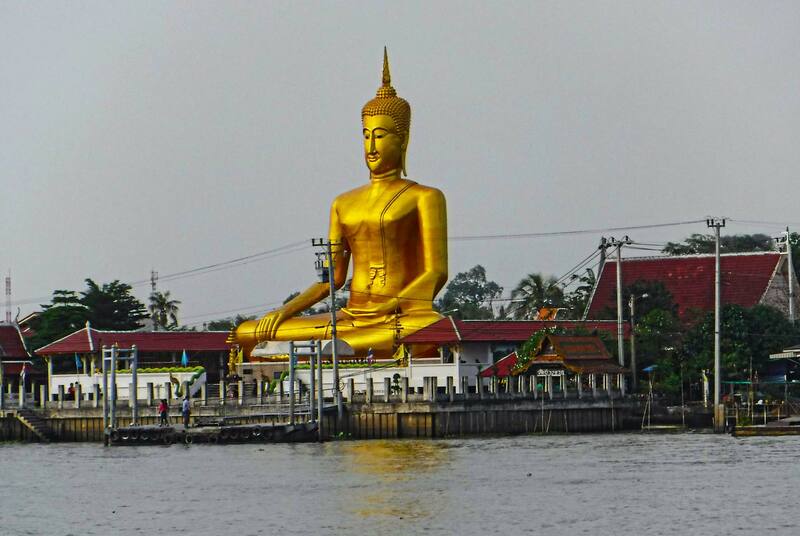 We left at 11:30am on a beautiful Sunday morning and took the BTS to Saphan Thaksin station and then boarded the Chao Praya Express river ferry. The 45 minute trip along this busy and vibrant river was both relaxing and pleasant. Whilst cruising past a fascinating array of modern and traditional architecture and river traffic, colorful characters filed on and off the ferry (ticket price is 15bt, or about 50 cents). We reached the final stop of Nonthaburi and wandered 100m past the old museum to the Rim Tang floating restaurant. Surrounded by aging Teak houses and meandering river traffic, time seemed to slow as we leisurely enjoyed a delicious Thai meal of Fried Catfish with Mango salad (Yum Pla Duk Fo), Omelette with Pork (Khai Jiaw Moo Sub), Stir fried morning glory with garlic (Pad Phak Boong) and Roasted eggplant salad (Yum Me Keur Yao). The only way to get to Koh Kret from here was either taxi (followed by short ferry crossing) or by hiring a private speed boat to take us directly there. We chose the boat (only 800 baht/$25 for the return trip) however I almost backed out when I saw it – tiny and noisy (and a little splashy! ), but the 15 minute trip turned out to be a lot of fun. Once we reached Koh Kret we simply followed the walking path which circumnavigates the island. The walk is quite pleasant, weaving between old wooden houses with small shops & cafes, Wats and small markets. Although the island has adapted to visitors, it’s still very much a basic Thai riverside village – charming, but quite poor. I think many visitors explore the entire island (around 5km) either by foot or rented bicycle. However we had other priorities (& were feeling lazy). Whilst my friend ducked into small alleys to visit potters and other artisans at work, I was on the lookout for beer! 5 minutes later and success! We came across ‘Chit Home Brewery’. It’s nothing more than a tiny run-down old house on the river, which at first had me worried. However once I’d put glass to mouth with a deliciously hoppy IPA, my fears were allayed and we settled down to enjoy a few ales. What a perfect place to relax and enjoy the afternoon! We stayed for another hour, sampling a dark beer and a lager, before heading back the same way we came. Surprisingly nobody fell out of the speedboat on the return journey. Once back on the Chao Praya Express we were treated to a beautiful sunset behind Wat Arun.